The holiday season means many things to me. It’s a time of peace and goodwill, precious moments with family and friends, and lots of sweets and treats. 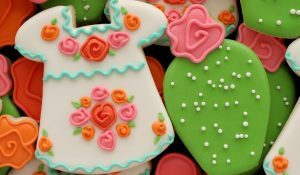 The holiday season also means that I will be super duper busy, so I’m always looking for cute cookie ideas that can be made in a hurry. 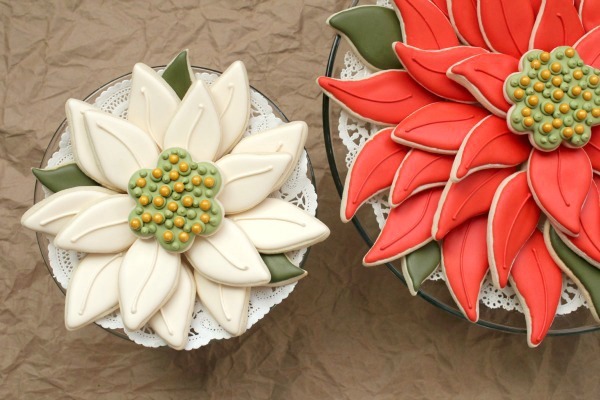 These easy poinsettia platters were the next logical step after my Thanksgiving Turkey platter. 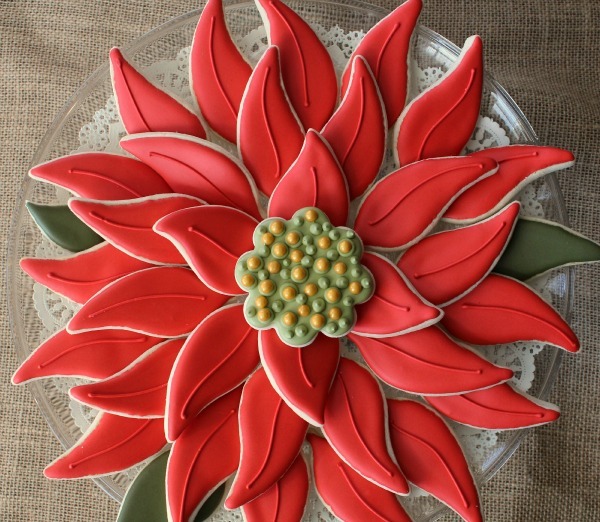 Using the same leaf cutter and a simple flower I arranged the cookies in the shape of this classic Christmas flower. Making this type of platter requires a bit of pre-planning but it’s really easy to do. 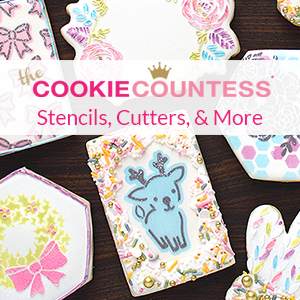 To begin, use your cutters to guesstimate how many cookies you will need. Bake a few more than you think you’ll need just in case. It’s better to have too many than not enough. Once the cookies are baked and cooled lay them out before decorating to get an idea of how the final arrangement will look. Next, transfer the cookies back to the cookie sheet in an organized fashion and decorate as simply as possible. 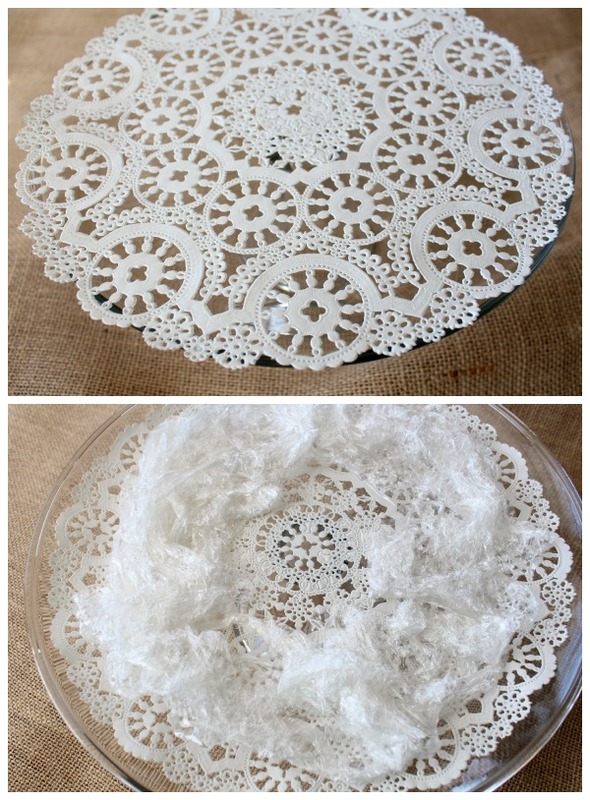 When you’re ready to put everything together start by layering a cake doily and a bit of plastic wrap on a round platter or cake plate to keep the cookies in place. Next, arrange the cookies around the edges building each layer until the platter is full. I added a few leaves as fillers, but this is optional. Finally, add the center cookie. I used a simple flower cookie decorated with gold sugar pearls, but you can choose anything you like. With minimal time and effort you can create a showstopping platter worthy of the most elegant holiday dessert table. This color palette would work well for these cookies, but they’d also look amazing in shimmery silver and blue. Don’t be afraid to experiment. I hope this idea makes its way onto your Christmas baking list. Ohmygosh, this is so, so beautiful … it took my breath away! these are absolutely beautiful. I may have give as gift this year. My sister, who is a minister, is leaving her church to lead a large congregation on the East Coast. Her members here are having a “going away” dinner for her on 12/23. If you don’t mind me borrowing your idea, I think I’ll make a large platter of cookies like these to add to the dessert table. What an awesome presentation! Of course not! That’s what I’m here for! Aww, thanks Callye – you are the best!!! Callye I LOVE LOVE LOVE this idea!!! I’ve been stressing about all the different platters I need to make for work friends, events, etc. and think your idea is not only beautiful but do-able! Thank you so much for the great idea! What an awesome idea! Beautiful! Absolutely fabulous!!! <3 Love it love it!!!! Thanks for sharing. Will definitely put this great idea to use. What an elegant and impressive centerpiece that would make at any holiday party, really beautifully done! what a beautiful idea. 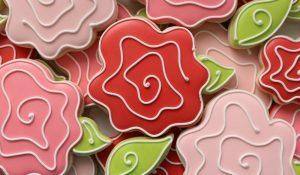 I love this – and as I start back again trying my hand with royal icing this might be the perfect cookie to try. Thanks! Have a great week. 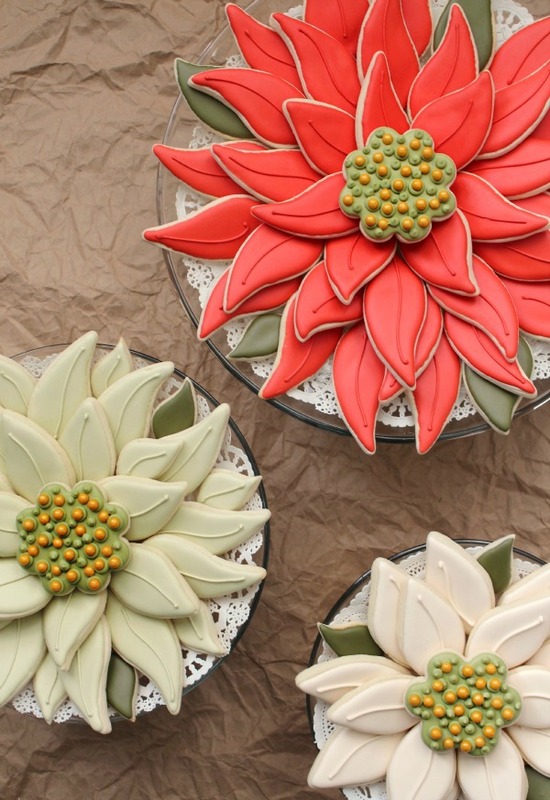 This is such a cool way to display cookies–what a great idea! I am in love with these, Callye! Gorgeous as always! Callye, Is there a cheaper place to get that gum leaf cutter than Australian. the cutter is $6.60 but the shipping is $42.00. Is there a place in USA that sells them. I can’t find it in the USA. 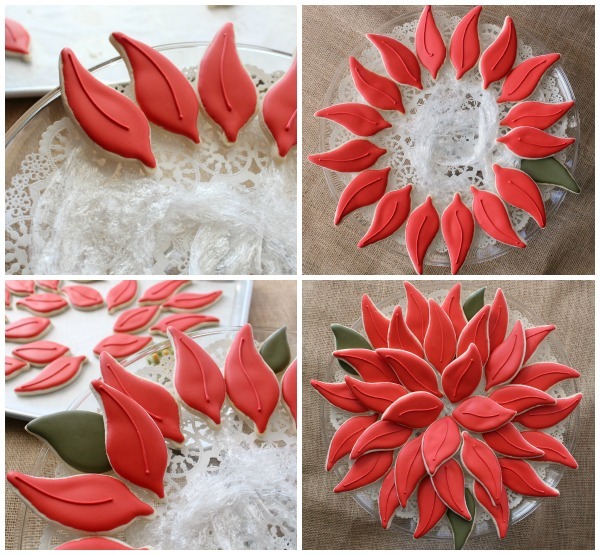 Barbara, Wilton sells a stacked set of three leaves marked fondant cutters that I like. You might also try your Christmas light cutter or a chili pepper, a paisley, or maybe a smooshed egg. These are gorgeous and so festive!! Girl, You will be getting an invite to both of our holiday parties—bring this! I adore this idea Callye! Callye…this is just brilliant! Love! Looks stunning. I can’t believe it’s easy to do. Have I told you lately how incredible you are????? I just love, love, LOOOOOVE this!!!! Oh my gosh! I may just have to do this because I could actually pull this off in time for Christmas morning! Wow!!! It`s a wonderful idea. They look so pretty. These are gorgeous! Such simple cookies that are just beautiful when you put them all together. Beautiful! Do you have any suggestions of places to get party platters? genius follow-up to the turkey platter! can’t wait to see what else you come up with this way. What a stunning presentation! I wish I could buy this from you for my holiday open house. I’m not very good at decorating cookies. How do you suggest wrapping these for delivery so not to mess up the design, but still look good too? Can’t wait to assemble mind…cookies are drying now! 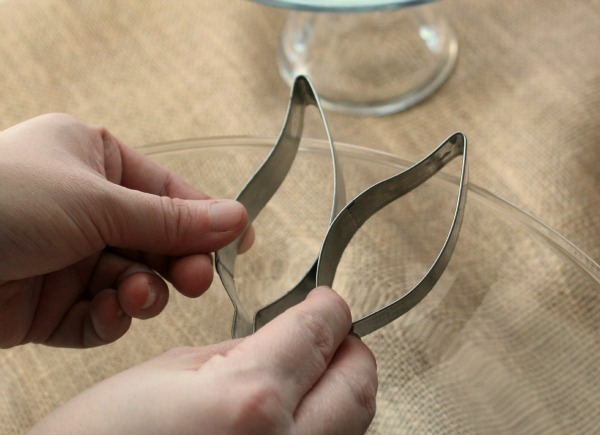 Where did you buy the cookie cutter? Amazing Idea!! Definately making this and your Turkey for the holidays!!! All I need now is the cookie cutter. 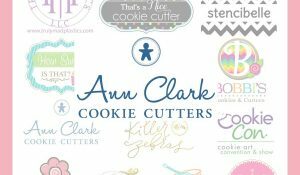 Where do you find the best selection of cookie cutters? Where did you get the leaf cutter… It’s such a simple shape and I can’t seem to find it anywhere and the one I made looks pathetic. As far as theissues 41 is having I am not seeing any problems. Try Hobby Lobby or Michaels. one of them was a gift from a friend from Australia so it may be harder to find. Both cards are absolutely stnnuing Mina… but what else can we expect from you but perfection?? LOL! We’re so used to it!HugsChristine xPS Couldn’t you just put a duff one in every now and again to make the rest of us feel just slightly better?? LOL! WOW! Looks incredible! I would love to try that. Just need to find the cutters! Thanks for the inspiration! Could you tell us how long the leaf cutter is and what size plate you used?? That info will help a great deal in finding the leaf cutter and assembling the poinsettia. Thanks for the simple, yet elegant, idea! Since money is tight! Thank you!!! Tried, fantastic idea! Thanck you! What do you use to make red? I used 3 ounces of Wilton no taste red and it came out pink. I ended up scrapping it, and going with off white which came out beautiful. but what’s your method?? 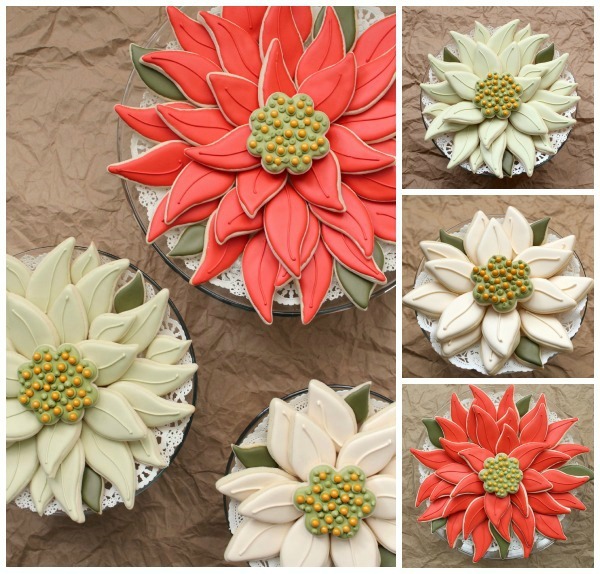 I love this idea of the Cookie Platters – thanks so much for posting these fantastic photos, very inspiring! Pingback: 10 Christmas Cookie Recipes - Home. Made. Interest. Please help! 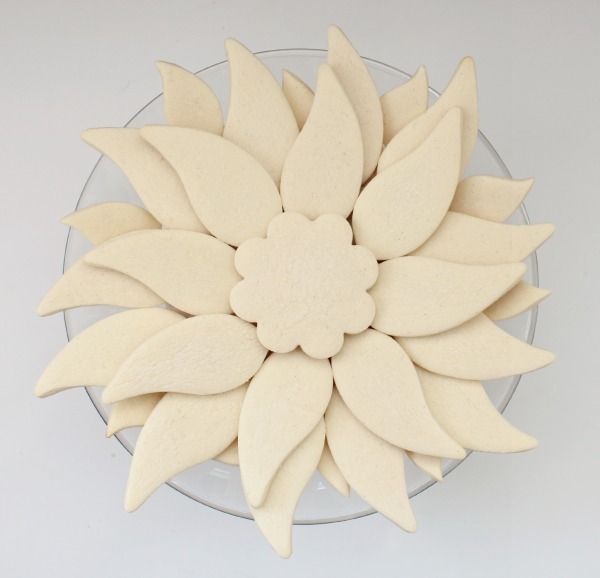 Those leaf or petal cutters you used in this cookies platter are eluding me! I have gardenia leaf cutters but they aren’t the same. I really would love to purchase the exact cutters you used. Please help! I need them before Christmas. Thank you so much for your time and all your fabulous ideas! I love your work! 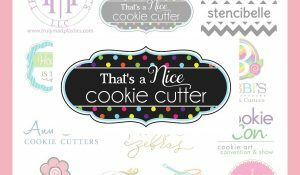 I finally found a cutter like this at Hobby Lobby just last weekend – the brand I found is Sunny Side Up Bakery. It’s a pack of three cutters, nested in each other, so I can make the leaves in different sizes. Thank you so much for this idea.. I made this is as a christmas gift for my son’s class teacher and she loved them..
what kind of cookie cutter/fondant cutter did you use for the centre of the flower? How many leaves in the red poisettia platter and in the white platter?